The road to be a licensed journeyman electrician in the construction industry is one of learning and understanding the general principles involved with the basic installations of all types of electrical systems. Many books and code classes can give you the general knowledge needed to progress to this level, but only actual on the job training can prepare you for the tasks required to become a licensed journeyman electrician. After becoming a licensed journeyman electrician the path one takes in the construction industry can vary greatly from one individual to another. An individual may decide that a journeyman electrician is all they want to achieve; others may want to progress to the level of a master electrician or several different other levels in the construction industry. These levels may include that of becoming an electrical foreman (oversees several journeyman) while still performing work, or an electrical superintendent (oversees several foreman) who plans and coordinates all aspects of a project. Another step would be that of becoming a project manager for electrical projects. A project manager is usually the person who estimates projects, buys all the materials and plans and coordinates the projects with either his electrical foreman orelectrical superintendent. The final step would be that of becoming the owner of your own electrical company, over 1.6 million workers acted as subcontractors for property owners in 2000. A career as a journeyman electrician is as broad as the imagination will allow one to see the future, and you are the future of our industry. Many prospective electricians start their career path in the construction industry at the entry- level position of laborer or sometimes even an electrician’s helper. This enables a person to see and experience first hand the actual installation and planning involved to properly installing many different types of electrical systems. However, this career path does not involve any class room training. Many of these electricians will never be able to become a licensed electrician and their future will be limited. Registered apprenticeship is the correct career path for a future career in the electrical field. There is no easy way to become a licensed electrician. Here is an outline of a typical electrical apprenticeship program. The apprentice works full time during the course of his or her apprenticeship training. 8000 hours (four years) of on the job training are required. In addition, employers are required to rotate the apprentice ensuring that the apprentice is trained on all major tasks of the electrical field. The apprentice attends schools one night a week from September thru May for four years. The four year class room training is based on the Wheels of Learning™ curriculum. The Wheels of Learning™ is a nationally recognized curriculum taught in almost every state. The apprentice will receive a certificate from the US Department of Labor upon completion of his or her apprenticeship program. In addition to the Wheels of Learning™ curriculum, the apprentices will study the National Electrical Code and will be prepared to take the journeymen electrical exam. A requirement of the program is that the apprentice pass the journeyman electrical exam. The apprentices start at 60% of the electrician scale and are given pay increases twice a year (5% of the electrician scale.) This is the minimum a company can pay their apprentices. Many companies pay top apprentices more than the apprenticeship scale. Most companies pay the entire cost for the apprenticeship program as long as the apprentice maintains a passing grade. The Wheels of Learning™ curriculum is also taught in many South Carolina high schools. Students who complete Electricity I and II in high school may receive credit up to one full year of class room training in the adult apprenticeship program. Summer employment is also available starting after the junior year of high school. Many high school students are enrolled in apprenticeship programs right out of high school. The Charleston area electrical contractors employed over 35 high school juniors for summer employment. Journeyman Electrician – four years in the trade and requires documentation of two (2) years prior work experience under a licensed Electrician and successful passing of the South Carolina journeyman electrical exam. Master Electrician – four years in the trade and requires documentation of two (2) years as a licensed South Carolina journeyman Electrician and successful passing of the South Carolina master electrical exam. Job opportunities are expected to be excellent, as demand for skilled Electricians is expected to outpace the supply of workers trained in this craft. Many potential workers may prefer work that is less strenuous and has more comfortable working conditions. 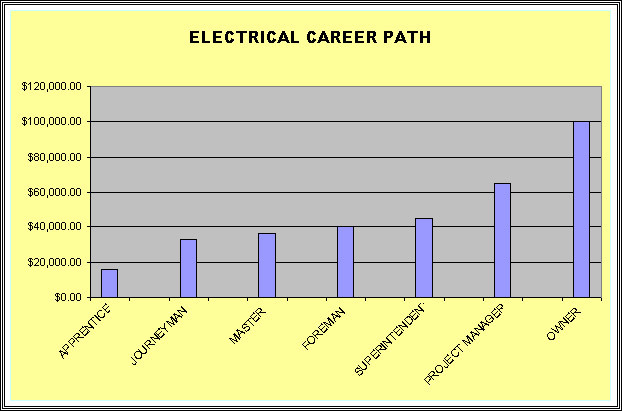 Employment of Electricians is expected to grow about as fast as the average for all occupations through the year 2012. Demand for Electricians will stem from building renovation, including the increasing installation of sprinkler systems; repair and maintenance of existing residential systems; and maintenance activities for places having extensive systems of pipes, such as power plants, water and wastewater treatment plants, pipelines, office buildings, and factories. The enforcement of laws pertaining to the certification requirements of workers on jobsites will create additional opportunities and demand for skilled workers. In addition to new positions resulting from employment growth, many jobs will become available each year because of the need to replace experienced workers who retire or leave the occupation for other reasons. Traditionally, many organizations with extensive electrical systems have employed their own Electricians to maintain equipment and keep systems running smoothly. But, to reduce labor costs, many of these firms no longer employ full-time, in-house Electricians. Instead, when they need an Electrician, they rely on workers provided under service contracts by electrical contractors. Because construction activity varies from area to area, job openings, as well as apprenticeship opportunities, fluctuate with local economic conditions. However, employment of Electricians generally is less sensitive to changes in economic conditions than is employment of some other construction trades. Even when construction activity declines, maintenance, rehabilitation, and replacement of existing piping systems provide many jobs for Electricians. Electricians are among the highest paid construction occupations. Median hourly earnings in the industries employing the largest numbers of Electricians, pipe-fitters, and steamfitters in 2002 are shown below. Install conduit systems and wiring. Install light fixtures, switches, and receptacles. Install control systems for complicated machinery. This includes automated control systems based on computer and PLC logic. Install electrical distribution equipment to safely distribute to flow of electrical to all electrical equipment and machinery. Install UPS systems and backup generators to ensure the power stays up and running for critical systems. Install all work in accordance with the National Electrical Code and applicable local codes. Many electrical contractors also install computer cabling, fiber optic cabling, fire alarm systems, sound and A/V, home automation, and computer systems . Building and Construction – Knowledge of materials, methods, and the tools involved in the construction or repair of houses, buildings, or other structures such as highways and roads. Mathematics – Knowledge of arithmetic, algebra, geometry, calculus, statistics, and their applications. Installation – Installing equipment, machines, wiring, or programs to meet specifications. Repairing – Repairing machines or systems using the needed tools. Manual Dexterity – The ability to quickly move your hand, your hand together with your arm, or your two hands to grasp, manipulate, or assemble objects. Finger Dexterity – The ability to make precisely coordinated movements of the fingers of one or both hands to grasp, manipulate, or assemble very small objects. Multi-limb Coordination – The ability to coordinate two or more limbs (for example, two arms, two legs, or one leg and one arm) while sitting, standing, or lying down. It does not involve performing the activities while the whole body is in motion. Extent Flexibility – The ability to bend, stretch, twist, or reach with your body, arms, and/or legs.